Macramé is an extremely old handicraft. Its basic techniques are easy to learn and are widely appreciated. Here you're going to learn how to tie the reef knot. This basic macramé knot is the starting point for other knots, this reef knot is therefore an absolutely indispensable part of the art of macramé. Step 2 To make a macramé design in reef knots, place 2 cords side by side: this gives us 4 strands. The role played by the strands: the inner strands are called filler cords, they are not actually used and by the end of the design they are barely visible. Cord colors: when starting out, it's easier to work with two lengths of cord in different colors (if you make a mistake, it's obvious very quickly!). 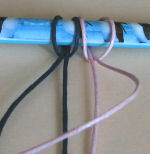 Start by passing the right-hand strand over the 2 middle strands (the filler cords). 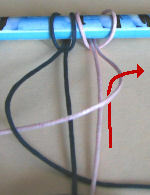 Step 3 The left-hand strand passes over this strand, then under the filler cords: it must exit (red arrow) through the loop formed by the right-hand strand and the middle strand. By repeating steps 2 and 3 several times you get a pretty twist ! For a flat design, you need to reverse the knot, as in step 4. Step 4 Pass the left-hand cord (now pink) over the 2 filler cords. Next, bring the right-hand strand over this cord and under the 2 filler cords. Bring it back up through the loop thus formed. Step 5 This is the design that you get by tying 2 reef knots, one after the other. A series of reef knots like this is called a "barrette". The outer cords are the 'worker' cords, they are used much more and quickly become shorter in comparison with the 'filler' cords in the middle. Our tip lies inalternating the cordswhen starting a new motif.